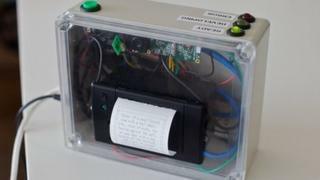 A camera which produces written descriptions of scenes rather than photographs has been invented by a student in the US. The device uploads pictures to the web which are described within minutes by users on Amazon's Mechanical Turk service. The short description is then sent back to the camera and printed. It was developed by Matt Richardson , an Interactive Communications graduate student at New York University. "I'd been thinking a lot about how cameras capture a lot of metadata when we take a picture: the location where you are, it captures the date, the camera make and model," he told the BBC. "A lot of information, but most of it's not really useful or has limited use." The machine uses a BeagleBone, a tiny computer used to power prototypes and other experimental computers. It links up to Mechanical Turk, a service in which people can perform menial tasks in exchange for small sums of money. In this case, Mr Richardson paid $1.25 (80p) for each picture to be described. "I had started off by sending a very low price and it was taking about 15 minutes for a description to come back," he said. "I wanted to get a response much faster. I incrementally raised the price, and I finally hit this $1.25 mark - which is about the cost of a Polaroid print. At that price, a description would come through in about three to six minutes." As well as using Mechanical Turk, Mr Richardson also added a setting on the camera which would send the picture to any available online friends to describe for free. Mr Richardson said that while there was no practical technology available to carry out the same task, he hoped such innovations would eventually exist, giving the camera more useful applications. "I was picturing a time in which cameras could possibly capture more useful information that can then be searched, cross-referenced and sorted," he said. "While the technology isn't really here yet, I thought it would be interesting to make a camera that would explore that 'what if?'" He said he noticed that most people adopted an analytical tone to describe pictures rather than offer any human emotion. "They speak very plainly about it, they're being very subjective. They're not making any value judgements or saying something is pretty or ugly," Mr Richardson said. "I think perhaps I could coach people and say feel free to throw in your own opinions about it. If something's pretty, say it's pretty." Has hi-tech killed pro photography?